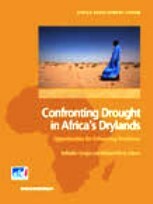 Drylands are at the core of Africa’s development challenge. Drylands make up about 43 percent of the region’s land surface, account for about 75 percent of the area used for agriculture, and are home to about 50 percent of the population, including a disproportionate share of the poor. Due to complex interactions among many factors, vulnerability in drylands is high and rising, jeopardizing the long-term livelihood prospects for hundreds of millions of people. Climate change, which is expected to increase the frequency and severity of extreme weather events, will exacerbate this challenge. African governments and their partners in the international development community stand ready to tackle the challenges confronting drylands, but important questions remain unanswered about how the task should be undertaken. Do dryland environments contain enough resources to generate the food, jobs, and income needed to support sustainable livelihoods for a fast growing population ? If not, can injections of external resources make up the deficit ? Or is the carrying capacity of drylands so limited that outmigration should be encouraged ? Based on analysis of current and projected future drivers of vulnerability and resilience, the report uses an original modeling framework to identify promising interventions, quantify their likely costs and benefits, and describe the policy trade-offs that will need to be addressed. By 2030, economic growth leading to structural change will allow some of the people living in drylands to transition to non-agriculture based livelihood strategies, reducing their vulnerability. Many others will continue to rely on livestock keeping and crop farming. For the latter group, a number of “best bet+ ? interventions have the potential to make a significant difference in reducing vulnerability and increasing resilience. This report evaluates the opportunities and challenges associated with these interventions, and it draws a number of conclusions that have important implications for policy making.